Susan May Warren is the author of the Christiansen Family series. If you like to be pulled into a family, and become intimately familiar with all the good and bad, and see them push away and come back together – this is the series for you! So if that does not appeal to you, you should question why? I question why I love this series and all the many characters. The answer? I like to see trials and struggles and watch how people overcome, push through and grow in the end. I like to see what healthy conflict resolution can look like, and sometimes what bad conflict resolution looks like. While in the Army I realized about midway through my time served that I learned far more from the leaders above me who were terrible, and I had several! I love Col Cash, while serving in 5th Battalion, Aviation, but I am not sure I learned much about him because he was great. But MAJ Angevine – OH MY!! what learning when on while serving with him!! Honestly the closest staff I ever served on was while serving with him. And wow, did we are all learn. So, when I read a book like this and see families struggle and fight and almost come to blows, I see forgiveness lived out. I see redemption offered. I see God move. This sweet novella does not have quite the drama that some of the other books in the series have, but as a wife, this particular conflict the main characters face is one dear to my heart. Communication in marriage. So often we get married and think it is all going to be wonderful. However, we bring our own selfish ideaoligies into the marriage and that alone creates conflict. Add a few decades of raising a family, and you might have a recipe for disaster if past hurts and wounds are not allowed to see the light of day, and ultimately heal. THe head of the Christiansen family, John and Ingrid are facing an empty nest, they are dealing with unknown ground, and they are not talking heart to heart. John thinks he can “solve” the problems, Ingrid is blaming him for something that happened over a decade ago. However, watching each side through this story gives you a glimpse into how things can be resolved, but also how thoughts get jumbled at times and makes a situation worse! I enjoyed this quick read that I was able to start and finish while staying at my Uncle & Aunt’s on the way up north. It is a sweet winter time story that would be a grey Christmas gift, or a book to grab when the weather turns cold! 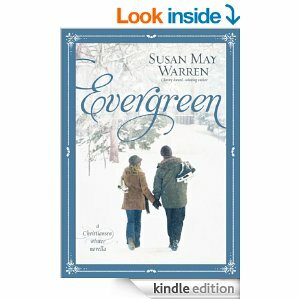 I love Susan May Warren and all of her novels – and this one is a great one!! 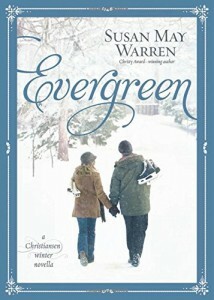 NOTE : I received a copy of Evergreen in exchange for an honest review.